For flexible, lightweight comfort, check out our selection of handmade deerskin women’s moccasins including Women's Casual Shoes, Women's Comfort Shoes, Women's Moccasin Chukka Boots, Women’s Moccasin Knee High Bootsand Women’s Moccasin Slippers. Deerskin Leather is uniquely soft and supple and do not require a "breaking in" period. They easily mold and contour to your feet. Because of this, our handmade women’s moccasins are made from genuine deerskin leather that literally wraps around your foot and heel for a perfect fit. Deerskin leather is also rugged, ranking as the third strongest leather available, belying the tremendous comfort and softness one experiences when wearing deerskin footwear. At Footwear by Footskins we match comfort with lasting durability in every pair of Handmade Leather Moccasins or Custom Made Women’s Moccasins that we create. All our handmade women’s moccasins are made in America using genuine American leather. For unsurpassed flexibility, experience the breathable, lightweight comfort that only deerskin leather can provide in a moccasin. 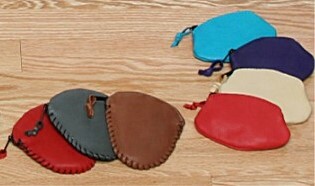 Ask us about handcrafted Leather Moccasins for Men and Handmade Moccasins for Children. 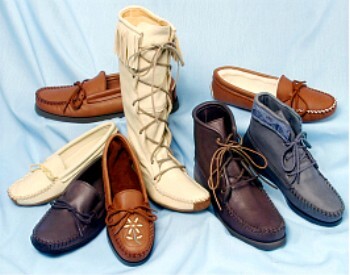 For more information about women’s moccasins including women’s moccasin boots, women’s comfort shoes and women’s moccasin slippers please Contact Your Handmade Leather Moccasins Representative or call us at 507-498-3707 weekdays, 8:00 – 5:00, CST.